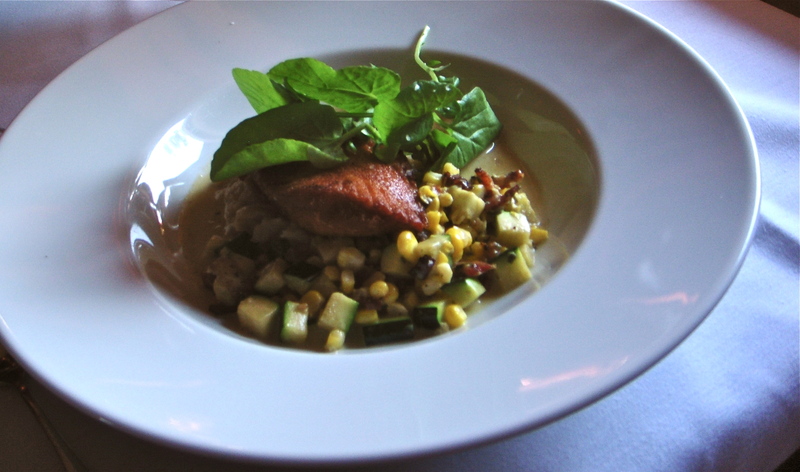 Chinook salmon with corn, zucchini hash. Labor Day weekend: Three gloriously lazy days lay out in front of us like a well-fed housecat on a hot day. And what better way to start a long weekend than a leisurely day of sipping local wines, followed by an intimate dinner with family. Saturday was warm and windy, and wildfires in Central Oregon and near Mount Hood made the already-soft September light that much more hazy. The views promised by the latest edition of Portland Monthly were sure to be obscured by smoke. Undeterred, we — J, Zandra, James and I — met in Tualatin and started our excursion. We headed first to Penner-Ash Wine Cellars, with sweeping views of the Chehalem Valley from the patio overlooking the well-tended garden. We sampled Viognier, Pinot Noir, Syrah and Rubeo, and toasted our good fortune at living in such a beautiful place. Next, it was on to Trisaetum (pronounced tri-SAY-tum), an elegant winery/art gallery with a stunning barrel cave in the basement. After that, we stopped at Lemelson and Anne Amie wineries, picking up more Pinot Gris, dry Riesling and Pinot Noir along the way. Happily we bumped down the dusty gravel roads, our wine-laden trunk weighing heavily behind us. Not the most strenuous activity, wine tasting nevertheless piques the appetite, so at 5:30, we headed to Tina’s in Dundee for an early supper. The cozy dining room has a cottage feel with soft yellow walls, sunny windows and a central fireplace. Crisp white table linens add a refined note to the otherwise casually intimate space, which fills up fast, even early in the evening. The menu showcases local and seasonal products, of course, so in keeping with our day, we started off with a Cristom Estate Pinot Gris to complement our starters: grilled calamari on a bed of greens; a glorious, generous slice of country duck pate; and pan-fried Yaquina Bay oysters with sorrel sauce, the oysters so tender they dissolved on the tongue. The next course offered a choice of the house salad or corn soup, a sweet, creamy burst of color that tasted like sunshine, and evoked the childhood memory of creamed corn. For entrees, Zandra and I ordered the Chinook salmon, seared crisp and served atop a corn, zucchini and pancetta hash with silky fennel puree beneath. Summer … Pow! James had the tenderloin with roasted fingerlings, porcini and a darkly rich demi glace — delicious flavors, but unfortunately the beef arrived cooked beyond the requested medium rare. For J, it was the roasted duck breast, cooked perfectly medium rare (in your face, tenderloin), and accompanied by a cabbage and jicama slaw and a crunchy, savory-sweet walnut cornbread. And dessert: bubbly blueberry cobbler a la mode and, for the chocolate fiends among us, chocolate mousse cake with chocolate truffle ice cream. Dragging our full bellies and heavy trunk, we headed back to Tualatin where we divided the day’s booty. Family, good food, good wine. One memorable day. The smoky view from Penner-Ash. Black-eyed Susan a la Penner-Ash. The view at Anne Amie.